The demo for EA's Need for Speed: Hot Pursuit has had a strong reception since it debuted two weeks ago. The latest Need for Speed had a great reception at this year's E3, garnering a lot of positive buzz and a bunch of awards for Best Racing Game of the convention. Since the demo was available for download on October 26th, EA reports that it has been downloaded 2 million times, making it the best performing demo since the series began in 1994. 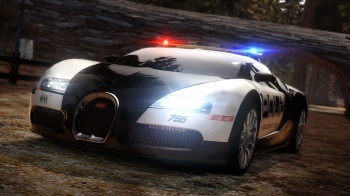 Such statistics bode well for a successful launch when Need for Speed: Hot Pursuit comes out November 16th in the U.S. and the 19th in the U.K. on Xbox 360, PS3 and the PC. The success of NFS:HP can only be problematic for the oft-delayed Gran Turismo 5. While NFS is definitely a lot more "arcadey" than the more strict simulation of Gran Turismo, I'm not sure how many racing fans will be purchasing two titles this season. Will Sony finally try to get GT5 out the door in time to compete with NFS on the PS3?